For many business owners, the first few months of starting and running your own business are extremely exciting. It’s a feeling that’s difficult to explain to people who don’t run their own businesses because it’s very personal. You know you’re going to be the best entrepreneur because you’ve read all the books and are certain you’re going to dominate like Apple, lead like Jack Welch, create happiness like Zappos, compete in the Blue Ocean market like Branson, sell like Zig Ziglar, and invest like Buffet. Your first team is amazing. Everyone is excited, committed, and motivated – they’re David against Goliath out there. This team meets every day, officially or unofficially, with the unofficial meetings taking place around the foosball table (a requisite for all start-ups because that was also in the books). Your sales pitch to clients, “We don’t have the overheads the big guys have, so we can charge you less” works from time to time and so does, “We are not a big corporate so we are much more responsive.” At this point, you’re picking up customers slowly, staff numbers are increasing steadily, and your investors are happy. Who needs a raincoat in paradise? And then one day, you walk into the “zone”. All of a sudden, in what seems to be the most innocuous moment, you are no longer the “golden boy” of entrepreneurship. Competitors are competing hard, clients are very demanding (some are unhappy), staff have split into camps, and investors are getting edgy. A storm is brewing and you still have your Bermudas on, because who needs a raincoat in paradise? You immediately try to fix things by motivating your team, meeting your clients, and showing stats to your investors. But you now have staff that don’t care like they used to, some clients think your product is useless, and your investors only want to talk about the bottom line. 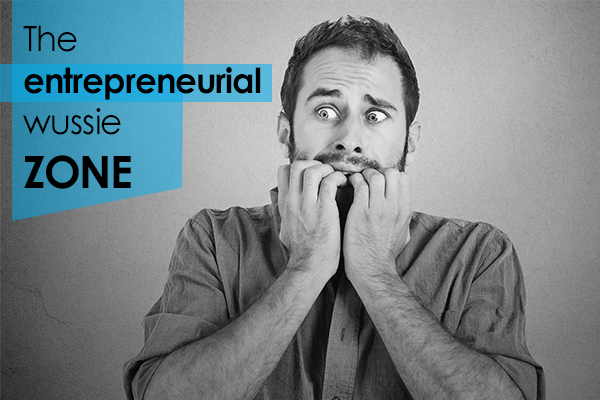 In situations like these, entrepreneurs take one of two doors – either door A (the “wussie” zone) or door B. Activity at the foosball table drops significantly because your team are now required to meet some tough deadlines. It’s critical for your (and their) future to deliver on these deals otherwise you’ll lose your client forever. You attempt to motivate your team and work with them, but they are uninterested. When you contracted with your client, you were certain that you would deliver on the date agreed upon based on past experience, but now find you need extra time and the client says no. You end up missing the deadline and lose your client. Luckily, you have other clients that you’ve had for a while, but they don’t really appreciate your “differentiator” that you have been working so hard on (well at least working hard on telling them about it). Client A starts negotiating with you and you eventually drop your price – enough to show the client you are weak. You no longer feel the excitement of a hunter bringing back the kill, but feel more like a chef who’s been asked to cook up an order. Client B asks you to make your product mod so that it looks and feels the same as other products out there. You make the changes because you tell yourself you are being customer-centric, and you need to do this to save your business. A client invites you to an industry dinner one night and your competitor is there with a big smile on her face which makes you feel awkward. Before you can decide on whether or not to greet her, she ignores you flat and you start wondering if she knows that you lost your client. Not being liked is a hard place to be. Some of your staff no longer like you and your clients are out of the honeymoon phase and are now “shopping” around. There are men and woman at your competitors who are sitting in boardrooms and planning your demise. This is an incredibly tough situation to be in, and you have to face it every day. You long for the days when you were the “golden boy” and everyone seemed to like you. “Perhaps this is not for me,” you ponder. “It’s a dog-eat-dog world when you grow a business and I prefer running a small operation,” you conclude. You choose door A, the “wussie” zone. Building a big business is not for everyone you tell yourself and it’s a personal choice whether you want to grow a small business or a big one. And you are right, it is a personal choice. But far too often I watch young entrepreneurs make compromises in order to be liked, not be offensive, and to appease. Had they not made those compromises, but rather had the courage to stand up for their beliefs and stand up to their detractors and wayward staff, they would have built the businesses they dreamed of creating. I believe this is not a problem of choice, but rather a problem of courage and self-esteem. And the net result is either failure or a small entrepreneurial business with an entrepreneur inside wondering what might have been if he had chosen door B instead. He should have chosen door B.